Keysight Technologies, Inc. (NYSE: KEYS), a leading technology company that helps enterprises, service providers, and governments accelerate innovation to connect and secure the world, today announced that the company has been recognized for its continuing excellence and product innovation. EM Best Awards are India's only electronics industry awards that celebrate excellence and achievements of true pioneers. The awards celebrate companies for their entrepreneurial spirit, bringing innovations, outstanding performance and best services. Electronics Maker is a most popular technical journal and online portal that uniquely designs and publishes technical articles, market trends, news, reviews, interactions, case studies, application notes, product information, business and financial news, and a wide variety of other information relevant to the electronics industry. This is Cyber Defense Magazine's sixth year of honoring Cyber Defense innovators. 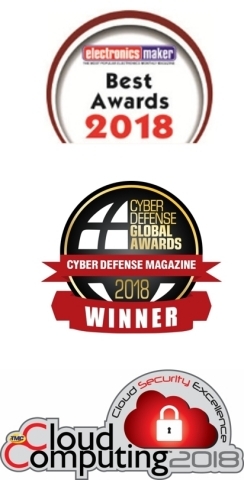 The Cyber Defense Global Awards are designed to find winners in as many countries as possible. Our submission requirements are for any startup, early stage, later stage or public companies in the INFORMATION SECURITY (INFOSEC) space who believe they have a unique and compelling value proposition for their product or service, with a balance of those located in North America, Latin America, Europe, Asia, Africa and the Middle East. TMC, a global, integrated media company helping clients build communities in print, in person and online, today announced the winners of the 2018 Cloud Computing Security Excellence Awards. The Cloud Computing Security Excellence Awards, presented by Cloud Computing magazine, honor solutions in two categories: those that most effectively leverage cloud platforms to deliver network security, and those providing security for cloud applications.